Jones Hooves are a huge hit with dogs! 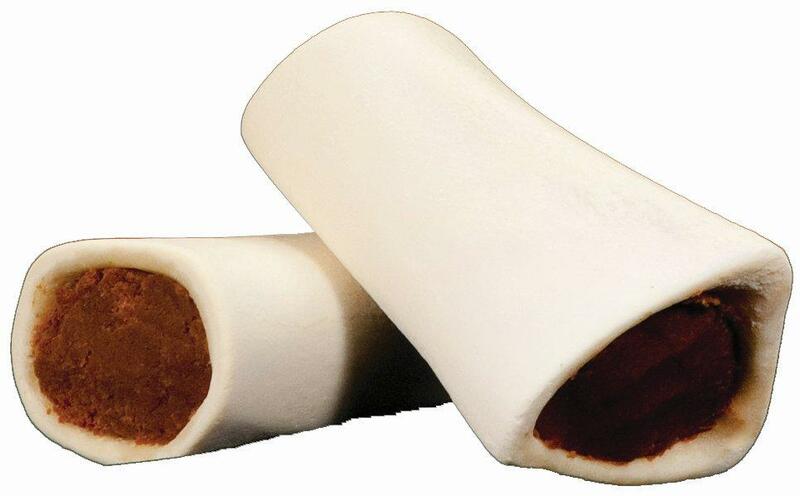 Great for gnawing (dental health), and easy to carry around, there’s a lot to love about the hoof! I’m going to tell y’all Sadie’s convoluted tale today, and Barkley’s story tomorrow. It’s convoluted because my friend who owns Sadie is the step mom of my son’s ex-girlfriend, still best friend. Okay, it’s a mess for other reasons. Sadie, meet my dog friends. Dog friends, Sadie. Sadie is gnawing a Jones Hoof. This is shortly before we sent her outside with the hoof. Hooves stink when being gnawed on. Sadie is about six years old. Her mama rescued her at about a year old. 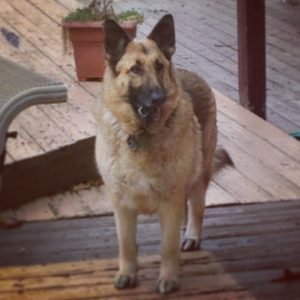 We were trying to figure out her age, since I was volunteering in her mom’s classroom (third grade) when she got the phone call from the vet telling her she needed to come rescue this poor German Shepherd. It’s not a story of mean people, or of bad breeders. Doesn’t Sadie look happy with the Jampacked Jawzer? She’s getting the chicken and cheese out of the middle. The owner’s dad had a heart attack when Sadie was about three months old and the owner’s life fell apart. Sadie was left in the goat pen for nine months. Oh alright. That’s neglect. And I have no idea what happened to the owner or the dad. Nor do I care. 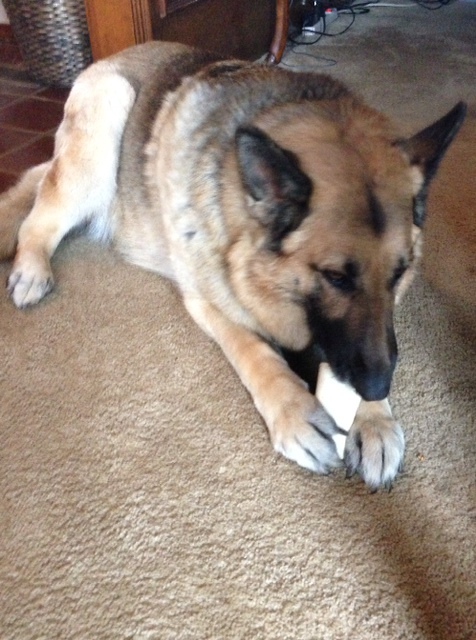 Leaving a gorgeous purebred Heidleburg shepherd in a goat pen for nine months … Don’t bark at me. I know that human life is precious. Nine months is an awfully long time to forget you have a dog and decide not to find a good home for it, though. 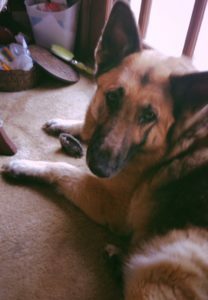 Sadie was antisocial, filthy, dog aggressive, when my friend, Diana, brought her home. I’ve interacted with Sadie several times in the last five years and there’s never been a hint of that rescue dog. Be it excellent breeding, or a loving home, or both, she’s a well adjusted dog who took the Jampacked Jawzer from my hand without snapping. She’s so well-adjusted that she made the transition to being a two dog family when Barkley arrived over a year ago. The two dogs seem to get along well. 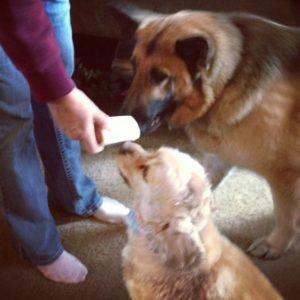 Sadie has learned the fine art of stealing treats from friends and replacing them with lesser treats. Good dog. So how do you win a treat for your dog, a Jampacked Jawzer or Hoof? This tasty treat giveaway requires that you leave a comment at the end of this post. I use a random number generator to choose the winner. You have until midnight on Thursday, 4/4/13, to leave a comment. I’ll announce the winner next Monday.